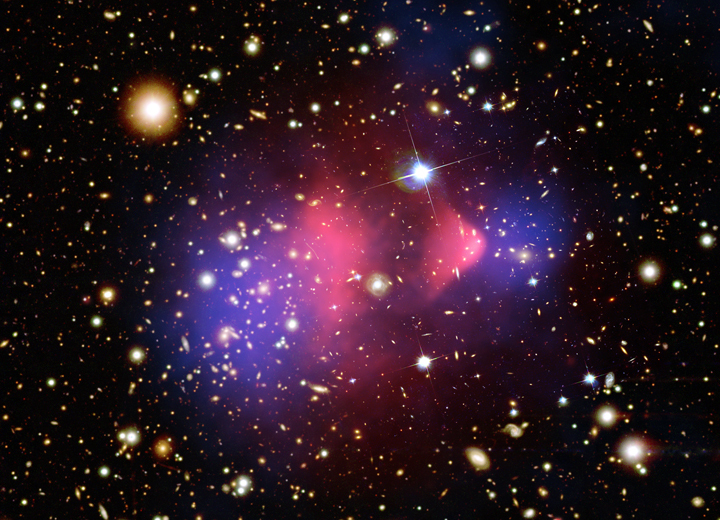 A purple haze shows dark matter flanking the "Bullet Cluster." The Hubble Space Telescope was used to observe how the Bullet Cluster bent light coming from background stars. As a rule, scientists seek certainty. So it's rather unusual that for more than 70 years, many astronomers have wagered the universe is primarily made of dark matter -- a mysterious and unproven substance. It's a bet that finally paid off, because a team of scientists working with NASA's Chandra X-ray Observatory has found direct evidence that dark matter is as real as the rings around Saturn. The discovery cements dark matter's status as the biggest building block in the universe, while also putting to rest the nagging worries of many astronomers that they gambled wrong. 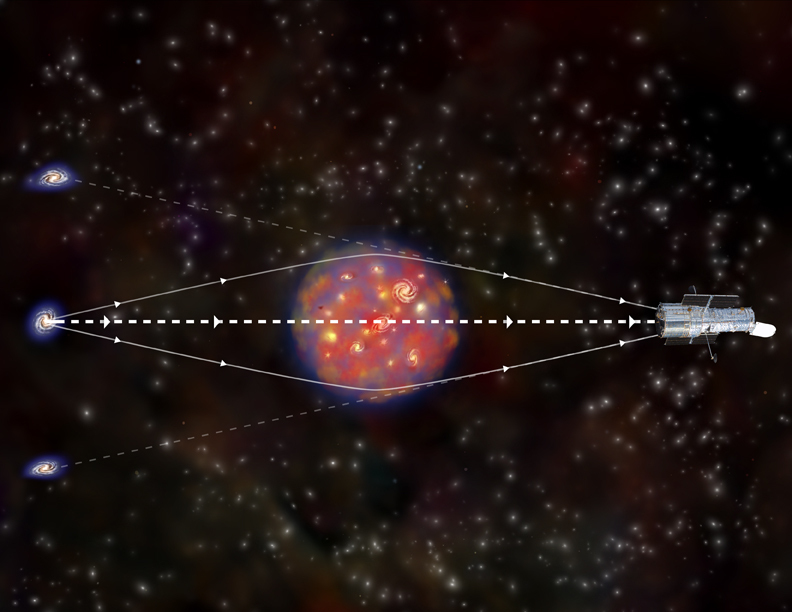 Dark matter's murky nature has always sat a bit uneasily with astronomers. "It is uncomfortable for a scientist to have to invoke something invisible and undetectable to account for 90 percent of the matter in the universe," said Maxim Markevitch, a Chandra astrophysicist and researcher with the study. One of the main arguments for the existence of dark matter involves galaxies and their clusters. Galaxies whip through space at enormous speeds and are searing with hot clouds of gas. Speed and heat of galaxies should cause them to fly apart, but they don't. A leading explanation for this is that the gas and stars are held together by the gravity of dark matter. Belief in dark matter is widespread across the scientific community, but astronomers don't know what it's made of. Still, they believe it acts like it has mass and exerts gravity, yet is invisible and can't bump, touch or crash into anything. Like determining the origin of the universe or how black holes work, dark matter is one of the holy grails of astronomy. "Little is known about it; all that the numerous searches for dark matter particles have done is rule out various hypotheses, but there have never been any 'positive' results," said Markevitch. Doug Clowe, leader of the study, set out to see if believing in dark matter was wishful thinking or informed faith. "A universe that's dominated by dark stuff seems preposterous, so we wanted to test whether there were any basic flaws in our thinking," said Clowe. Check out the article at NASA. It is important that we continue to research this phenomenon... it will lead to a better understanding of the universe as a whole and will probably generate new resources and technologies in the process.